Last Saturday, Angela and I were in the Church of the Nazarene in Morley for the Indie Book Fair, part of the 2018 Morley Arts Festival. It was a good day – well-organised, nice venue, friendly people – and I was delighted to give a short reading from An Ordinary Spectator. A few sales added to the warm glow. Of the 20 or so tables around the inside of the church, mine was one of 4 or 5 non-fiction displays. To complement the Yorkshire murder mysteries, stories for children and poetry collections, there were offerings on living in Africa, coping with a parent’s dementia and (clearly knowing its immediate audience) the pros and cons of independent publishing. Inspection of the products on show – confirmed by chats with the individual authors – left one in no doubt that all the books represented considerable effort and dedication; they were, by turn, imaginative and well-researched and attractively packaged. 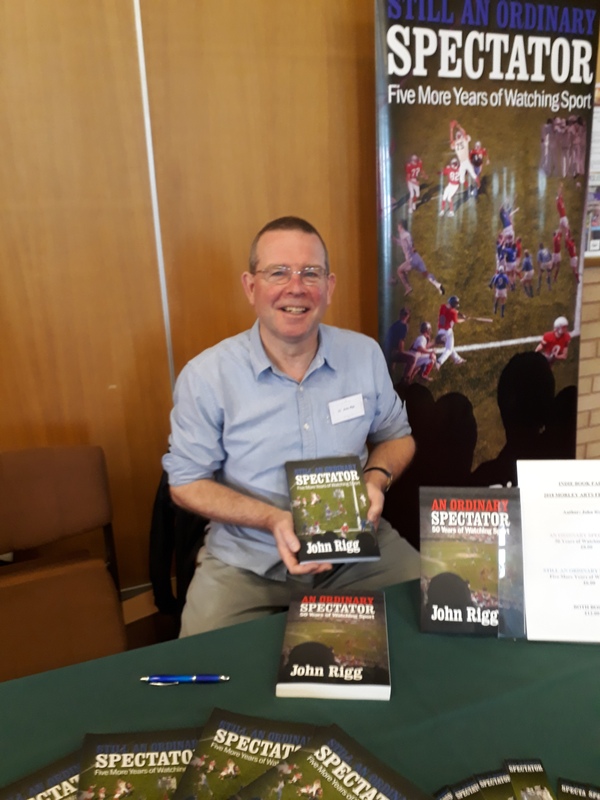 The Church is situated at the top end of a large supermarket car-park and so there was some passing interest from the more inquisitive of the Saturday shoppers as well as the obvious support from those with connections to the authors themselves, many of whom were locally based. I think it was the eclectic nature of our casual engagements during the day that I enjoyed the most: the middle-aged woman whose father had been a keen supporter of the Batley rugby league club; the eight-year boy who showed us a story he had made up, complete with illustration, involving goalkeepers and zombies; the elderly lady, pushing a shopping trolley, who informed us that her cataract operation had been postponed three times; the polite schoolboy who played at prop forward for one of Morley RUFC’s junior teams; the ex-Army man, whose book related his friend’s family stoically coping with their daughter’s Rett Syndrome… We learned some things during the day and we were the better for it. One man – about my age – spent some time examining copies of An Ordinary Spectator and Still An Ordinary Spectator. He read the back cover blurbs closely and studied the contents pages and glanced at some of the text. He checked the price list I had on display, which included the discount for a double purchase. He then replaced both books and nodded politely and set off on a tour around the Church to look at the other wares. Some time later, on completing his circuit, he returned to my table, smiled gently and duly bought both books. As I signed them for him, I must have given a knowing smile myself; his cautious approach to considering and reflecting on and then completing the purchase was exactly as I would have done. It was just before 4 o’clock that we dismantled the table and banner and, carrying lighter boxes than when we arrived, made our way back across the car-park. As we did so, I heard the brief – but discernible – roar of a crowd. It turned out that Scatcherd Lane – the home ground of Morley RUFC – was only a couple of streets away and that there was a match in progress. I looked up the details later. Morley now play in the Northern Division’s North 1 East League: the sixth tier in the hierarchy of English club rugby. On Saturday, they defeated Driffield by 39 points to 7. The young prop forward would have been pleased. There is a tenuous sporting connection to this blog, as discussed below. My sister, Rosie, and I have recently spent several days in the Niedersachsen (Lower Saxony) Land of Germany visiting some of the places associated with our family history. Our grandfather, Alfred Edgar Niblett, was born in Osnabrueck in 1888 to an English father, Charles James Niblett, and a German mother, whose maiden name was Anna Karoline Borstelmann. It was a highly successful trip. I knew that Anna Karoline Borstelmann died in Ludwig Strasse in Osnabrueck in 1938 at the age of 84. The city’s cemetery authority had previously informed me that the street no longer exists, but, in a local bookshop, I came across a map of the Osnabrueck tram system of 1906 on which the location was marked. It is now called Ludwig Baete Strasse (after a 20th Century writer and historian) and is a pleasant tree-lined street of post-Second World War housing. In the small town of Elze, to the south of Hannover, we visited die Peter und Paul-Kirche, in which Charles and Anna had married in 1873. It was curiously empty on the Sunday lunchtime, apart from two middle-aged women – the organist and a singer – who held a long practice session, perhaps 40 minutes or so, for the time we were there. The melodic sounds resonated down from the balcony and around the clean white walls of the church’s interior. Outside, I found the statue of Martin Luther, erected in 1883 on the 400th anniversary of his birth, to be both powerful and moving. The inscription read: Hier stehe ich. Ich kann nicht anders. Gott helfe mir. Amen! “Here I stand. I can do no other. God help me. Amen!”. This is reputed to have been Luther’s statement to the Holy Roman Emperor, Charles V, at the formal hearing in Worms in 1521. (In his monumental A History of Christianity, published in 2009, Diarmid MacCulloch notes that the phrase was only attributed to Luther after his death by the editor of his collected works). For the following day, we had hired an excellent local guide – Almuth Quehl – to show us around the village of Kirchwalsede and the town of Visselhoevede, including the two beautiful parish churches. At the former, Almuth had arranged for us to see some of the original church records. We started by finding the baptism record of Anna Margreta Marquardt – the mother of Anna Karoline Borstelmann’s father, Johann Friedrich Borstelmann, (and my great (x3) grandmother) – in 1772. I felt the lump in my throat as I saw her name on the page: I just about held it together. I have previously spent some time examining the comprehensive online database of Lutheran church records in Niedersachsen and was familiar with the long direct family line that goes back through the Marquadt, Lange, Dieckhof and Henke families to the baptism of Harm Henke in 1582. We looked up some of the other original records: the burial of Gert Dieckhof in 1713, the burial of Casten Henke in 1691, and so on. An unexpected bonus was that the written records contained additional information. Even in the Lutheran church, the type of service was, to some extent, dependent on the amount spent by the worshippers. Hence, the burial of Anna Marie Henke in 1711 was accompanied by “a sermon from the pulpit”. Elsewhere, the causes of death were given: the unfortunate Johann Lange died at the age of 56 three weeks before the Christmas of 1686 when a stone fell on him as he was digging a hole (presumably in the graveyard). The baptism of Harm Henke in 1582 was, of course, relatively early in the history of the Protestant Church; it had been only two generations earlier that Luther had nailed his 95 Theses to the door of the Castle Church in Wittenberg. Or, to put it another way, it was six years before Philip of Spain sent his Armada into the English Channel. As I looked around the church in Kirchwalsede, its interior neatly decorated with flowers from a recent wedding, I was aware that, even though it had been modified and repaired many times over the centuries, this was still the space in which my great (x9) grandfather had lived and breathed. And it was now, in a different context to Luther, that here I stood. On the Tuesday, our family researches completed for the time being, Rosie and I did the tourist run in Hannover. The bus tour took us past the Eriebnis Zoo and out to the Royal Gardens of Herrenhausen. Towards the end of the route we passed the HDI Arena – the home of the Bundesliga 1 side, Hannover 96 – the street in front of which is called Robert Enke Strasse. Robert Enke was a goalkeeper who played for Hannover 96 for five years from 2004. He also played for Benfica and Borussia Muenchengladbach, amongst other clubs, and won eight caps for Germany. He took his own life in 2009 at the age of 32. (The excellent A Life Too Short: the Tragedy of Robert Enke by Ronald Reng, published in 2011, is a detailed and poignant biography). After the bus tour, Rosie and I briefly went our separate ways and I paid my three euros to take the escalator to the top of the dome of the Neues Rathaus (the New Town Hall) for the views across the city and the surrounding plains. Then, in the late afternoon, I walked back to the football stadium, even though I knew that the gates were closed and access was not possible. (This was an obvious flaw in the schedule I had planned: Hannover 96 are at home to Hoffenheim next Tuesday). As I returned to the hotel, I attempted to marshal the conflicting themes that the overall visit had generated in the back of my mind. There is an obvious point about continuity and longevity, even amongst the turmoil and destruction that the centuries have brought to this part of the world. The Rathaus in Osnabrueck, heavily damaged in the Second World War, has been repaired to the Late Gothic design of the 1512 original; it was where one of the treaties of the Peace of Westphalia was signed in 1648 to bring an end to the Thirty Years’ War. In Bad Muender am Deister (where my great (x2) grandmother, Anna Perlasky, was born in 1829), the door of the imposing Steinhof is dated 1721 and names the family who owned the property at that time. Even in the Marktkirche in Hannover, also destroyed in the War and impressively rebuilt in red brick subsequently, the striking triptych at the altar dates from 1480. The theme of continuity is also evident in the robustness of the family line in Niedersachsen, irrespective of whichever of the various armies – Swedish or Napoleonic or Hannoverian or Prussian – have marched through the territory to claim the land. The local inhabitants – farmers, shepherds, builders, et al – got on with their lives and raised their families and prayed to God and kept going from one generation to the next. At the same time, I am conscious that there is also transience and fragility. In this respect, although I have mentioned the late goalkeeper of Hannover 96, I doubt that – on reflection – this is a blog about sport at all, not even tenuously. If it is, it is only a reflection of sport’s peripheral place in the much grander scheme of things. Rather, I might suggest that the blog is principally about connections and relationships and how, against the deep background of the long centuries, there is an inevitable impermanence to our being – whether 32 years for Robert Enke or 56 years for Johann Lange or 84 years for Anna Karoline Borstelmann. We all dip our hand in the flowing stream – some just a finger, others up to the wrist – and, in the rippling of the water, we leave the memories and traces for those that are left behind. …Once the match kicked off, I noticed that the spectators around me did not seem to have much patience with the Leeds [United] team’s efforts. They were not interested in fancy routines or intricate manoeuvres. They wanted instant results. Specifically, they wanted the ball to be deposited in the Charlton net and, when Leeds eventually put it there, it triggered a paroxysm of unbridled celebration from everyone on the terrace. It was the only goal of the game, but it was sufficient to meet the demands of the local supporters”. I was relatively late coming to live soccer. My father had given me my rugby league baptism (Hunslet vs Whitehaven) at the age of 6 in 1961 and taken me to watch Yorkshire play cricket (in the Roses match at Headingley) in 1966, but it was not until 1968 that I caught up with Leeds United at Elland Road . September 4th 1968 to be exact – 50 years ago today. Dad had no real interest in soccer – and was certainly not a Leeds United supporter – and so it was with some friends after school that I attended a relatively low-key match: a second round Football League Cup tie with Charlton Athletic. I described my initial impressions of the occasion in An Ordinary Spectator. My main interest was in seeing the individual players and, unlike the major clubs’ approach to the equivalent tournament today, there was little doubt that Leeds would field a near full-strength side. I duly made a mental note of the famous names – Bremner, Charlton, Hunter et al – that I was seeing for the first time, live and in the flesh. In the book, I also recognised how the match programme (price one shilling) now registered as a historical record of the times. In particular, the Club Notes included a piece on how the arrangements for the second leg of Leeds’s Inter Cities Fairs Cup final – the away tie with Ferencvaros of Hungary – which had been held over from the previous season, were somewhat uncertain because of “the Czecho-Slovakia-Russian political events of the last few weeks”. (The Russian tanks had rolled into Czechoslovakia a fortnight earlier). The club was using all the available means “to ascertain the situation, by telephone and cable”. I will return to the Leeds/Charlton match programme below. If I were to summarise my approach to watching soccer over half a century, I would describe it as opportunistic. I have not had the pleasure (or burden, delete as appropriate) of fervently supporting a particular side and so most of the games I have attended have been from a genuinely neutral perspective. The venues have been determined by a variety of factors: where I happened to have been living (Cambridge United at the Abbey Stadium, Wimbledon at Plough Lane ) or visiting ( Ipswich Town at Portman Road ) or just passing through ( Leicester City at Filbert Street on the way back to Cambridge after playing cricket in Loughborough). There have also been the occasional sojourns on foreign holidays (for home fixtures of Bayern Munich, Hertha Berlin and Espanol in the respective Olympic Stadiums of Munich, Berlin and Barcelona ). These days, I have an eclectic approach to day-trips from my Milngavie base, mainly to Scottish venues (Dumbarton, Stirling Albion, Albion Rovers), but sometimes further afield (Carlisle, Newcastle, Berwick). Looking back at the Leeds/Charlton match, one point that is of interest is the status of the two teams at the time. Leeds United were the current holders of the League Cup – their first major trophy – having defeated Arsenal at Wembley the previous Spring. The side would go on to lift the Football League Championship for the first time that season. Charlton Athletic came into the match as leaders of the old Second Division, though they were to finish third and outside the promotion places. In 2018-19, fifty years on, Leeds have been outside the top division for 15 years, whilst Charlton are now in League 1 (or League Division Three in oldspeak). More generally, half a century of promotion and relegation has produced its inevitable churn in the hierarchy of English football. Of the 22 teams in the 1968-69 First Division, 13 are in the 20-side Premier League of 2018-19, 7 in the Championship and two (Sunderland and Coventry City) in League 1. Further down the pyramid, the fates of the teams in the Third Division of 1968-69 vary from those now in the Premier League (AFC Bournemouth, Brighton and Hove Albion, Watford) to the 6 clubs that are no longer in the Football League at all. The drop-outs are particularly revealing, I think, because their composition is an echo of the broader economic shifts in the country as a whole over the last five decades. Of the 92 teams in the Football League in 1968-69, 15 are no longer in these top four divisions and, of these, 12 were situated above the Wash-Severn line. Their replacements include only 6 sides from this large region, the remainder being found largely in the more affluent South East. We can stay with this theme. Yorkshire has lost three clubs from the Football League of 50 years ago – Bradford Park Avenue, Halifax Town and York City – without replacement, whilst several of the other departures have been from geographically remote locations (from the rest of the League’s perspective) such as Barrow, Workington, Darlington and Torquay. (The accession of Yeovil Town slightly redresses this point). I make these observations without comment, as it could be argued that the “old” Football League was top-heavy with sides in the North of England and some sort of regional re-balancing was needed. Moreover, the arrangements for promotion and relegation to the League have been based on a meritocracy for many years, rather than the old system of election or re-election by the other member clubs. Finally, back to the match programme for Leeds United vs Charlton Athletic in 1968. I mentioned in An Ordinary Spectator that stapled within it was the “Official Journal of the Football League” – the Football League Review – which I assumed to have been attached to all clubs’ programmes in a given week. It looked worthy and dull and, at the time, I didn’t read it. I did look at this for this blog, however, and some of its contents are not a pleasant read. Quite apart from examples of casual sexism, there is one reference – in the “Opinion” column of Walter Pilkington of the Lancashire Evening Post – to the population of Bradford which is frankly grotesque. I mention this not to make an obvious point about the social mores of a past age and the differences in what was/is considered acceptable then and now. Rather, it is to illustrate how difficult it is – from the perspective of today – for me to make sense of the occasion of my first exposure to live soccer 50 years ago. And yet, in other respects, it does seem such a long time ago. The concurrence of the Rugby League and Association Football seasons for most of the 20th Century suggests that one would struggle to find players who had combined the oval ball with the spherical one at the professional level. However, there is one example from over a century ago which is quite remarkable. David “Dai” Davies, born in Llanelli in 1880, was a teenage rugby prodigy. He was a member of his home town rugby union side that lost only one of its 31 matches under the captaincy of Owen Badger in the 1896-97 season, playing at half-back. He signed for Swinton (for £20) in 1899, playing his first match in a winning side at Widnes. (Badger had preceded him to Swinton, having signed for £75 in 1897, though he had subsequently returned to Wales). Within a year, Davies was a member of a victorious Northern Rugby Football Union Challenge Cup final team. Swinton won the trophy on 28th April 1900 by defeating Salford 16-8 at the Fallowfield Stadium in Manchester, Davies himself scoring one of Swinton’s four tries. The following Monday’s Manchester Courier and Lancashire General Advertiser reported that the final had been “a great struggle” on “a fine day of bright sunshine with a breezy coldness in the air”. A “vast crowd of good-humoured and light-hearted sportsmen” – just under 18,000 paying spectators – had seen Davies score “a clever try”, which had been the last of the match and taken Swinton to their unassailable lead. However, perhaps the key moment in the game had been in the first half when, after a “regrettable incident” of “rough play”, the Salford forward William Brown was sent from the field. In his authoritative Rugby’s Great Split (1998), Tony Collins has reported that the Swinton players’ winning bonuses ran to ten shillings in the first round, £1 in the subsequent rounds and £5 in the final. These were the rewards, therefore, for accounting for Eastmoor, Holbeck, Oldham, Broughton Rangers and Leeds Parish Church before the victory over Salford. Remarkably, Dai Davies changed sports in 1902 and played for the next seven years in goal for Bolton Wanderers. What prompted his shift in allegiance is not clear – especially as he is reported to have had no previous experience of soccer at all – though one suspects that household economics came into it. He married Annie Salt in 1902 and they were to have a son the following year Tony Collins notes that, in the early years of the century, rugby league was in a generally poor financial state, whilst soccer was enjoying a boom period. Bolton were relegated to the Second Division at the end of Davies’s first season, but they reached the FA Cup final in April 1904, when they were beaten by Manchester City. Another Welshman, Billy Meredith, scored the game’s only goal. The Bolton Evening News reported that “Davies made one or two daring saves that at once made him popular… [though] he was helpless with Meredith’s scoring shot”. As he guarded the Bolton goal, Davies must have had a clear awareness of the contrast in the size of the respective sports’ premier events. The crowd at Crystal Palace was in excess of 61,000. Moreover, whereas the 1900 Challenge Cup had been presented to the winners by the wife of the President of the Northern Union, the guest of honour at the football showpiece was none other than the Prime Minister, Arthur Balfour. It was also in 1904 that Dai Davies became a soccer international, playing for Wales against Scotland and Ireland in the British Championships. He followed this up with an appearance against England at the Racecourse Ground in Wrexham in 1908. The circumstances of the last of these were highly unusual for the time, as Davies, having only attended the match as a spectator, came on as a half-time substitute. The Welsh goalkeeper Leigh Roose was injured in the first half and Davies was allowed to fill in with the home side 0-4 down; the final score was 1-7. The Manchester Courier reported that, although he was beaten three times, he “brought off some capital saves”. The soccer databases reveal that Davies played 123 times for Bolton Wanderers between 1902 and 1909: contemporary reports state that he was a “tough individual” who had an “indifference to cuts and bruises”. During this period, Bolton were the archetypal “yo-yo” side: promoted back to the First Division in 1905, relegated in 1908, promoted as Second Division champions in 1909. By the time of the next relegation in 1910, Davies had reverted back to rugby league, having re-signed for Swinton. He re-entered the team in a 0-16 defeat at home to Wigan on New Year’s Day. Davies had represented his adopted county of Lancashire three times in 1900-01 and his return to rugby league brought him further honours. In December 1910 – playing with his brother and Swinton club colleague, Dan – he scored a try for the Wales side that lost to England by 13-39 in Coventry. (The England-Wales fixture was an regular event in the pre-First World War period, the former winning 7 of the 9 fixtures between 1908 and 1914). In the same month, Davies captained Swinton in their first Lancashire Cup final, when they were narrowly beaten by Oldham in Broughton. The 1901 Census of England and Wales formally records the 20 year-old David Davies as a “fitter’s labourer” resident as a boarder in a house in Swinton. However, for the corresponding entry 10 years later, his sporting prowess was given full rein: a “publican and professional footballer” living in Salford with his wife Annie, younger brother Garfield and 8 year-old son, also Garfield. In September 1913, Davies was transferred on a player exchange to Leigh for whom he made his debut (again against Wigan) that month in a game that, according to the Leigh Chronicle and Weekly District Advertiser, “provided a series of sensations which kept 9,000 spectators at fever pitch”. (An aside. The newspaper also provided a report on the reciprocal ‘A’-team match between Wigan and Leigh, where the attendance was no less than 3,000). Although Wigan – with “a very strong Colonial and South Wales element in their team” (i.e. 4 New Zealanders and 5 Welshmen) – won the match 25-14, the Leigh Chronicle was clearly impressed with the local side’s new acquisition. Davies was “…a master of strategy… not only does he pass beautifully, but he has a tremendous kick with him”. Interestingly, the match report also referred to Davies’s build – which was sizeable for a half-back at 5 ft 11 ins and 13 stone – as being “very useful”. Unfortunately, Davies’s career was brought to an end by injury not long afterwards. By the time of its end of season review in April 1914, the local newspaper had revised its opinion of the early-season player exchange: “Dai Davies… only played in about five matches. Leigh had the worst of the bargain by a long way”. Davies remained in Lancashire in later life. He died in Salford in June 1944 at the age of 64, two months after the death of his wife. They are buried in Swinton Cemetery. Dai Davies was not only a dual international in rugby league and soccer, but also a participant in the two major Cup Finals in these sports. His was a unique and extraordinary sporting career, the high-level versatility of which – arguably – approaches those of his near-contemporaries Andrew Stoddart (1863-1915) and CB Fry (1872-1956). Today, it is Stoddart and Fry who are much better known. Their attainments were indeed mightily impressive – the former a dual captain of England at cricket and rugby (before the Great Split of 1895); the latter variously England cricketer and footballer, FA Cup runner-up with Southampton FC (in 1902, two years before Davies’s appearance in the final) and one-time world record holder for the long jump – and, unlike Davies, they duly have their column inches in the voluminous Oxford Dictionary of National Biography. Of course, Dai Davies was operating in a different social milieu. By definition, his was not the world of the “Amateur” or the “Gentleman”, but the hard-nosed professional. It is clear that, in terms of national recognition for sporting achievement in that environment, the bar was deemed to have been set much higher. The details of Dai Davies’s exploits are not lost, however. Some of the information presented here – rugby as well as football – comes from Gareth Davies and Ian Garland’s excellent Who’s Who of Welsh International Soccer Players (1991) and this has been supplemented by useful data sources such as Michael Joyce’s Football League Players Records, 1988 to 1939 (2004) and the splendid website of the Swinton Lions Supporters Trust (www.swintonlionsrlc.co.uk). It is something of a detective exercise to put the complete picture together, however. Dai Davies’s is a remarkable story of sporting achievement and it deserves to be better known. In Still An Ordinary Spectator, I note that my attendance at some sports events over the years has been based on a straightforward principle: the event was in the general vicinity of where I was living and there was no excuse not to go. Hitherto, the most extreme example occurred in April 2015, when I walked to the end of our street – literally – and crossed over the Auchenhowie Road to the Milngavie and Bearsden Sports Club, where I watched a couple of matches at the Western Wildcats Hockey Club. For last Wednesday’s Women’s Time Trial at the 2018 European Cycling Championships, I did not even have to go that far, as the course actually included Auchenhowie Road, which I did not need to cross. It was 9.30 in the morning. We were in a group of about 50 – adults in their cycling gear (“Newcastle West Cycling Club”), young children with their bikes and crash helmets (and parents), some elderly ladies, a keen photographer crouching on his haunches – together with the volunteer stewards and a couple of policemen. The junction with Glasgow Road was a good spot from which to observe the race. It was a tight right-handed bend, which forced the cyclists to decelerate as they came up from Waitrose before speeding up again along another fast stretch. The light rain and dampened road added to the technical requirements. A couple of riders misjudged the turn and brushed their arms against the spectator barriers. The 34 competitors had set off at one-minute intervals from the centre of Glasgow, but a number had already changed their places in the irregular procession before they reached us, just over one-third of the way along the 31 kilometre course. One of these was the winner of the event for the last two years – Ellen van Dijk of the Netherlands – who had been the last to depart. After we returned home, we learned that Van Dijk had completed the hat-trick, defeating her compatriot, Anna van der Breggen, by two seconds. For the Men’s Time Trial, after lunch, we had to walk about 100 yards further on to the Glasgow Road to observe the cyclists make their way towards the traffic lights at St Paul’s Church and up the hill leading to Strathblane. (Their route was 45 kilometres). Although our phase of the race was greeted by pleasant sunshine and a light breeze, the local vagaries of the weather meant that the final run into Glasgow was met with squally rain. As with the morning’s race, the defending champion held on to the title by a very narrow margin: Victor Campenaerts of Belgium was judged to have outpaced the Spaniard, Jonathan Castoviejo, by less than one second after more than 53 minutes of racing. Contrast that with BMX Cycling. On Friday, we took in the Qualifying rounds of that sport’s European Championships at the Glasgow BMX Centre in KnightswoodPark. Previously, I had only caught glimpses of BMX racing on television, where it comes across as fast and frenetic and intimate, with the rider in a chaotic maelstrom with the other competitors. I can report that it comes across as exactly the same when viewed in the flesh, but also with its own requirements for skill and control and – in a slightly strange way – with its own elegance. The stands were nicely full in the early afternoon sunshine and I was not surprised to see many young children – boys and girls – eagerly and attentively watching with their parents. The prospects for the sport look good, if these are the enthusiasts of the future (as well as the present), perhaps to the detriment of the numbers participating in older traditional ball games. The course started with a precipitous 8 metre descent – I’m afraid that I wouldn’t have got beyond that point, especially at the riders began by pedalling furiously on the way down to build up their momentum – and then ran over 400 metres of variable humps and bumps on four parallel straights bounded by three 180 degree curves. In these Qualifying rounds, the Men’s heats (or Motos) comprised 3 series of ten races; the Women had 3 series of four. The MC provided a running commentary from the side of the track, his enthusiasm consistently revealed. The British rider Kye White won one of his heats having “crept up like a tiger stalking his prey”. Later, another rider “just got squashed at that corner a little bit”. However, I did think that, at times, the presentation was somewhat rushed; it would certainly have benefited from having individual introductions of the riders and their nationalities before their first appearances. The races came thick and fast: 42 in an hour and 20 minutes, even with a lengthy hold-up after the rider representing Germany, Liam Webster, had taken a heavy fall. Indeed, one race started before the previous one had technically finished, as another faller had remounted his bike and was just completing the final straight when his pursuers were hurtling out of the start-gate. Incidentally, I was captivated – somewhat morbidly, I admit – by the start itself: the release of the gate following the dull tone of the hooter sounded as if the executioner had pulled the lever of the trapdoor. Both the Men’s and Women’s World Champions – Sylvain Andre of France and Laura Smulders of the Netherlands – were present and both won their three Qualifying races, although the latter’s younger sister, Merel, did seem to ease up when favourably placed against her in two of them. The following day, the elder Smulders retained her European title. In the Men’s final, Andre finished third behind the tiger, Whyte, and Kyle Evans of Great Britain, who took the gold medal. My appetite for the Men’s Road Race around central Glasgow yesterday had been whetted by the Women’s race on the previous weekend. (“Two Wheels Good – Part 1”, 7th August 2018). It was the same 14 kilometre course, though the men had to complete 16 laps rather than nine: the equivalent, I suppose, of their respective tennis counterparts playing 5- and 3-set matches at Wimbledon. We took up positions at various vantage points throughout the city centre: Buchanan Street, St Vincent Street and West George Street (as the week before), the bend leading into the final straight at Glasgow Green, the bottom of the long sweep down the High Street, the short but steep incline of Montrose Street… It was at this last point, about half-way through the race, that we saw that the World Champion and pre-match favourite, Peter Sagan of Slovakia, was suffering from some sort of mechanical trouble and falling behind the peloton. He recovered to join its tail end, but did not last much longer, dropping out with six laps to go. From the start of the race, a group of seven riders (later reduced to six) broke away from the main field; at one point they had a lead of over five minutes. After they had been reeled back in, another breakaway formed of ten riders. We viewed them at Charing Cross as they headed out to KelvingrovePark and the West End for the last time. On their return, a few minutes later, there were only five: the result, it transpired, of a crash at the far end of the course. It was from this select group that Matteo Trentin of Italy was to win the final sprint for the line on the Green. It was a gruelling race: nearly 6 hours in drizzly conditions on a wet surface. I would guess that considerably fewer than half the starters completed the course. Amongst the steadily reducing peloton, the grimacing faces were progressively darkened by their continuous exposure to the sprayed wet dirt of the city streets; on their final lap, they looked like miners emerging from their underground shift. Behind them, the individual stragglers looked to any means to circumvent the rules and ease their passage; slipstreaming behind one of the support cars was not uncommon. I noted that, on two separate occasions, one of the riders from eastern Europe firmly grasped a water bottle being held out of the window of his support car (and did so for some time) as he struggled up a long ascent. “He’s got a sticky bottle”, exclaimed one of the stewards, sarcastically, “He’s not even pedalling”. I knew it was against the rules, but – perhaps I am getting soft – I also sensed where my sympathies lay. The rider had negotiated over 200 kilometres on a dreich day on a demanding course; he was detached from the remainder of the field; his body would have been sore; and he was a long way from home. I cannot say that I would not have done the same. This is the first occasion on which several sports are holding their European Championships in the same cities at the same time. These arrangements are currently being inaugurated in Berlin and Glasgow. The former has the athletics and “Glasgow” has everything else (though its catchment area has been liberally expanded for this purpose): golf (in Gleneagles), rowing and triathlon (both in the Strathclyde Country Park), swimming, diving (in Edinburgh) gymnastics and cycling. On different occasions this week, various members of the family are accompanying me at a range of cycling events: yesterday evening’s programme in the Sir Chris Hoy Velodrome, tomorrow’s Men’s and Women’s Time Trials through the streets of Glasgow and East Dunbartonshire, the Men’s and Women’s Road Races on successive Sundays and Friday’s qualifications races in the BMX events. We are currently part-way through the programme. The Women’s Road Race took place over 9 laps of a 14 kilometre circuit through the city, starting and finishing on Glasgow Green. The proximity of the long straight stretches of St Vincent Street (on the outward journey to KelvingrovePark and the West End) and West George Street (on the return) meant that we could flit between the two without having to wait long for the caravan to pass. Both roads are also fairly steep – a regular feature of the course – so we had good views of the cyclists on both a demanding incline and a speedy descent. Elsewhere, we also took in the perspectives from the front of Queen Street Station, where the riders emerged from a chicane skirting the church of St George’s Tron, and the pedestrian precinct in Buchanan Street, close to where the much-missed Borders Bookshop used to be. A group of five riders broke away on the second circuit but, by the time of our Buchanan Street viewing on lap five, the young British rider Sophie Wright had established a lead of about 35 seconds over her nearest rival with the main group further behind by over a minute. The game can change quickly, however. By the time we had returned after a quick sandwich in Eat (on the seventh circuit), Wright had been reeled back in and her brave adventure thwarted. The race was won by the Italian, Marta Bastianelli, just ahead of the Dutch World Champion, Marianne Vos. The Dutch featured prominently at the Velodrome on the Monday evening, winning two of the three gold medals and one of the bronzes up for grabs. We saw the last two (of the four) stages of the gruelling Women’s Omnium event, in which the first two places were contested by the veteran Kirsten Wild and the local favourite, Katie Archibald from Bearsden. Archibald brought about the loudest roars of the evening when she won the final sprint of the Elimination stage of the Omnium and a couple of the intermediate sprints in the 80-lap (and 20 kilometre) finale to the event, but Wild skilfully tracked her throughout the latter race and ensured that she extended the points lead that she had established in the earlier rounds. The Netherlands national anthem was then repeated as the powerful Jeffrey Hoogland won the final of the Men’s Sprint by defeating the German, Stefan Botticher. Indoor track cycling has its own captivating – almost mesmeric – qualities as the eye follows the riders around the circuit. It is also no place for the faint-hearted. Three of the Omnium riders took heavy tumbles during the course of the evening (one of them twice), but all got back on the horse and resumed their journeys. I was amazed that there weren’t more crashes, given the speeds being reached and the continual jockeying for position. I thought of a murmuration of starlings soaring and diving: each member in control of her individual space whilst being part of the larger whole. The spectators in the Velodrome, most of whom were obviously rooting for Archibald, were generous in their support. They acknowledged the courage of the riders who had taken a tumble and, later, dutifully stood (with only one or two exceptions) for the Russian anthem when Maria Shmeleva swept home in the Women’s 500 metre Time Trial. Of course, the Velodrome audience had – one assumes – chosen to be there. For the Women’s Road Race, the spectators in Glasgow city centre would have comprised cycling enthusiasts, casual observers, Sunday shoppers and the rest. I suspected that most people would have been aware of the event, not least because of the various road closures and access limitations that it had necessitated. Not everyone, however. As I was leaning on the barrier in Buchanan Street, I was approaching by an elderly man with a wispy beard and a couple of carrier bags. “What’s happening here?” he asked with a quizzical smile. “Oh, that’s good. At least it’s not something political”. The 2018 UK Indie Lit Fest took place on Saturday at the Kala Sangam Arts Centre in Bradford with 30 authors, an international hub and readings and workshops. An Ordinary Spectator and Still An Ordinary Spectator took their place – with a reading – amongst a predominantly fiction-based line-up: 50 Shades-lite, paranormal horror, poetry and murder mysteries. An interesting – and enjoyable – day.